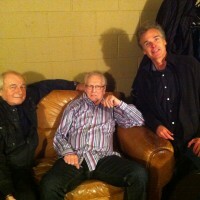 I saw Ginger Baker at Jazz Alley in Seattle last night with his band Jazz Confusion. A pretty amazing experience. It was a great show. I’m going to try to get back there tonight. Ginger Baker is pretty grumpy. I had the good fortune to meet him before the show. He was so cranky it was endearing. I think it’s partly genuine crankiness and partly his very dry, dark english sense of humor. Half way through the emcee’s introduction Ginger barked at him in the mic “get off! 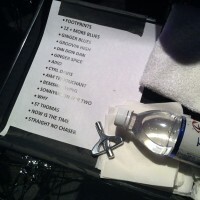 !”, motioned abruptly, pointing the emcee off stage and just started playing. When he came back for an encore he said “you just want to see me die”. It was pretty funny but judging by his wheezing voice it was not entirely out of the question. He was like a cranky old grandpa who didn’t want to get off the couch after Thanksgiving dinner. I met Alan White at the show and he asked me if I’d like to go back and say “hi” to Ginger before the show. Ginger was telling Alan the whole time before the show how we was too tired to play, he said he couldn’t do the show. Alan basically told him to “shut up and get onstage”, “once you’re up there you’ll forget all about it”. Which he did. Everyone thought it was because he’s so old but Alan said he used have the same conversation almost every night when he was a member of Ginger Baker’s Air Force back in the 70s. It was funny listening to them talk. Alan’s english accent always notches up whenever he talks with another Brit. They basically speak another language. Ginger was clearly not in very good health but his playing was awesome. He was SUPER solid, played thunderous tom fills and was extremely musical. The deep groove was tangible. There was some really cool interaction between Baker and his percussionist Abass. They have a long connection rooted over 40 years ago in Nigeria. 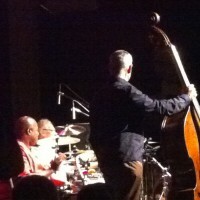 Abass’ uncle was one of the musicians that Baker first played with when he moved there in 1970. Abass’ was only 10 years old at the time. His drum set was DW. 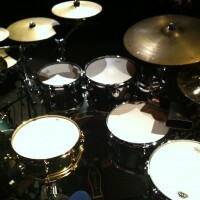 The snare and bass drums were the same green DW drums he played at Royal Albert Hall for the Cream reunion. The toms were backline rental sourced here in town. He brought his own cymbals, a combination of old and new. His hi-hats and riveted ride looked like old A’s. 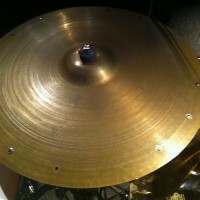 The rest were various modern Zildjians. The whole kit roared. 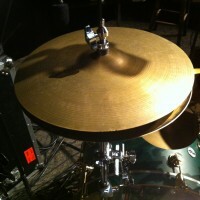 he hounded the sound man all night to turn up his hi-hats in the mix onstage. I think he’s probably getting a little deaf. His monitor was 20 inches from his ear. I was sitting about 40 feet away with his monitor pointing right at me and I could hear it louder than anything in the band!! nd I agree with him 100%. Charlie Watts told me that in his opinion Ginger is the best rock drummer ever. I now understand what Charlie meant. There is actually a great similarity in the way Ginger and Charlie play the drums. Charlie is obviously much more restrained but both have this very stiff yet aloof, explorative approach (sorry that’s the best way I can describe it) that really knocks me out. They both come from very similar musical backgrounds. It makes sense. Michael Derosier from Heart was also at our table. I had to stop for a second and remind myself that I’m in a club, watching one of the most storied drummers of our time and sitting with 2 of the my favorite drummers. Michael was inducted into the Rock and Roll Hall of Fame last year and Alan was just nominated this year. Not a bad tuesday night!